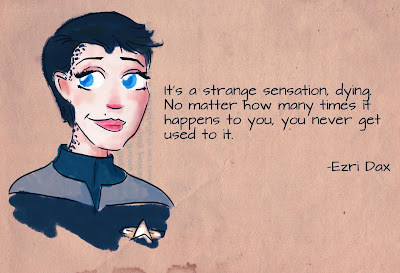 Been watching a whole lot of DS9 Season Seven lately and, boy, there's a whole lot of Ezri Dax in these episodes. It seems like she's in the center of just about every single story. It seems like bringing a brand new character in (actually two counting Vic Fontaine) was like a gift to the writers. It's as if they said, "Here's a whole new person (who we already kind of know so we're instantly emotionally invested in her) now lets write a ton of stories exploring this new character and her potential." Enterprise Watercolor: We Have A Winner!